In an era where nameless, faceless and meaningless have become standards, Korn have transcended hard rock and heavy metal banality with a sound and vision that defies categorization. They bubbled from the Bakersfield, CA, heavy metal underground more than a decade ago, emerged as a hard rock phenomenon with the breakthrough success of Follow The Leader in 1997, and have exceeded any and every conceivable expectation since then. It may seem premature to consider Korn legends in only their second decade as a band, but not when you acknowledge the facts. Impressed by numbers? Korn have released seven albums, surpassed the 25 million mark in worldwide sales (more than 15 million of those in America alone), and have had every album since their self-titled debut enter the Billboard Top 200 Album Chart in the Top 10, with all seven of their studio albums achieving Platinum sales (their 2004 Greatest Hits release is certified Gold). The numbers don’t lie, but they don’t even begin to tell the story of Korn, who not only redefined heavy metal with the diabolic, cutting-edge histrionics of their 1994 debut, but turned the industry on end in the years that followed, having a profound influence on today’s heavy music scene and making a marked impact on the way metal has reemerged as a sonic force on the pop-driven musical mainstream. In one fleeting decade, Korn have single-handedly changed the way America views heavy music. Now, with the release of See You On The Other Side, they’ve opened the doors to even more disarray, taking their trademarked sound to the next level. It’s what they’ve always done, but to even more astonishing depths. A hybrid funk and medicating, metallic shimmer radiates from opening track “Twisted Transistor,” steamrolling into the abrasive guitar attack of “Politics,” the industrial textures of “Throw Me” and the military precision of the anthemic “Coming Undone” (“With the ‘We Will Rock You’ drums, I call that our dark Sergeant Pepper song,” says frontman Jonathan Davis). While “Eaten Up Inside” and “Getting Off” don’t stray far from the decimated path Korn have left in their wake, the true gems are found in their more forward-thrusting manipulations. While Davis notes that “Love Song” is a song sure to impress “all my depressed, goth peeps out there,” his delivery is more in the style of David Bowie than death metal Bauhaus. But in true Korn tradition, if there are stylistic barriers, they’ll smash them. The new album runs the gamut from industrial-edged, arsenic-laced litanies, to heavy metal tirades. Where better, then, to introduce their current arena tour – with the most expansive headlining show in the band’s history – than in one of Hollywood, CA’s most celebrated cemeteries? Amidst the final resting sites of a host of celebrities including Richard Pryor, Joey Ramone, Jayne Mansfield and Rudolph Valentino, Korn conducted a press conference in mid-January to announce their current run of dates. 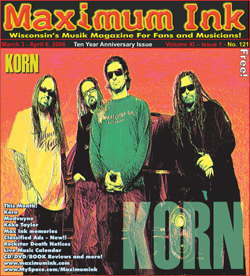 MAXIMUM INK: At this point, Korn are one of the few metal bands with a legacy. Are you worried that by having a press conference in a cemetery you might be perceived as campy? FIELDY: I think when people see photos of us doing this, they’re just happy to see the pictures, it doesn’t matter where they’re at. When I was a kid, I always wanted to see new, updated pictures, I didn’t care where they were from. If you ask me, I think this is gay, but it doesn’t matter! Kids want to see us, they don’t care if there’s a skeleton and candles in the background, a hearse, a cemetery, a beach, who cares. MI: Is image important to Korn? MI: This is a different-sounding album than previous Korn records. It goes in a lot of different directions within the rock realm. Was that the intention from the outset? F: The whole production team, Atticus Ross [Nine Inch Nails, Bad Religion] and Matrix [Avril Lavigne, Britney Spears], bringing them in brought in a whole new flavor. Also, losing a member [former guitarist Brian “Head” Welch discovered God, was “born again,” and denounced Korn in the process] changed the chemistry of the band, so everything worked together for the good of the band. That’s really all that happened. To me, this is the first Korn album ever, we’re a new band now. Every record is going to keep getting better from here. It doesn’t matter what’s behind us, we’ll keep making music as long as there are people that want to hear it. MI: The album cover brings to mind illusions of childhood stories, then there’s the whole “other side” aspect of announcing your tour in a cemetery. Is there a way the album title is supposed to be interpreted? F: With See You On The Other Side, we just got out of a ten-year contract with our record label, we were free, and we lost a band member. It’s really like we’re inviting people to the other side of Korn, but people can interpret it however they want. MI: How about the album art? F: It is very Alice In Wonderland-ish. There’s this kid in New York, and when we played CBGBs he had his artwork on display next door. He’s amazing, and he drew the stuff up based on a lyric that Jonathan wrote. MI: The cover looks like it could be the same kid from the Life Is Peachy cover. Is that the case? MI: Will the stage show be consistent with the artwork? F: It will be one of the biggest, over-the-top tours that we’ve ever done. We’re actually putting all of our money into it, and basically not making any money on it. Everything we make is going to have to pay for the show, and it’s going to be the longest set we’ve ever played in the history of Korn. MI: You brought a second guitar player out on your last tour, but he wasn’t onstage. Will that be the case again? F: Yeah, Rob Patterson will be out with us again. There will be some percussion and backup singers, almost like an orchestra in the background, and he’ll be with them. They’ll be part of the show, but just not on the main stage.